I am a big fan of speakers at conferences that tell you about all the stuff that went wrong. I would rather learn from someone else’s mistakes than my own. I already have far too many “learning experience’s” here at Greener Pastures Ranching. Too many of the speakers explain how easy and trouble-free their particular production practice can be. I have found that that is not always the case. I have had a few discussions on social media lately about swath grazing so I think we should “dig” into that this month. Feeding a large herd of cattle with an hour of work every week makes a lot of sense to me, but it is not always as easy and worry free as a lot of people lead you to believe. With a little planning and being prepared for what can go wrong, it can lower your labour and equipment costs quite a bit compared to traditional feeding. I hope that you can learn from some of my experiences and try to keep your swath grazing mistakes to a minimum. What can go wrong? How about not enough snow? The most common question I get about swath grazing is “what about too much snow.” The truth is I have had more trouble swath grazing with not enough snow. Too much has only stopped me once. Not enough has caused me trouble three times. Twice I have been stopped while swath grazing because we only had two inches of snow. Here is the scenario. The cows were doing great on a field of pea straw residue. We were still grazing in February and had a warm spell that melted the snow on top of the swaths. It is always nice to get those warm spells but then it cooled off again very fast and froze the wet swaths solid. I ended up with concrete swaths that the cows could no longer graze. We were also relying on the snow as a water source so they were totally out of feed and water literally overnight. The snow was gone and the swaths where solid as a rock. I learned that I needed to have a backup plan to get through that time period. That warm weather might be a disaster in disguise. After a week or two the ice will disappear and the cattle will again be able to graze. It won’t happen every year but plan for it. I know of a producer who had to deal with a few death losses due to the same situation. Watch the weather reports if you get a warm spell. If I am counting on snow as a water source and if I don’t get any, my labour costs go way up. I now always plan for a backup just in case. Hopefully there is a dugout close by where, if I need to, I can set up a continuous flow water system of some type that won’t cause me too much extra labour. One year, four months of pumping water and hauling water cost me an additional $3,600 in labour. “But what about too much snow?” Okay, if I get deep snow that gets hard and crusty, some cattle have trouble. If this happens, I start pulling out the “skinnies.” With swath grazing, you get three types of cows: the diggers, the skinnies and the opportunists. The diggers open up the swaths and find the feed. They do fine every year. The skinnies are the cleanup crew. They follow behind and clean up whatever is left over after the diggers move on. They usually lose condition as they are eating less and get the lower-quality feed. Don’t forget to cull these. The opportunists hang around the front of the swaths with the diggers and steal the feed as the diggers pull it up. It’s quite entertaining if you have a chance to watch it. Sometimes when the snow is hard and deep, the face of the open swath will freeze overnight. If I think they are having trouble getting started again in the morning, I will help them a bit by digging down by hand and pulling up a handful of feed and sticking it in the snow. Repeat this on as many swaths as you would like to open up and then let them go to work. Once they get started on the new swath their hooves should break up any ice and give them access to the swaths for the rest of the day. Some throw a horse or two in with the cattle to help find the swaths in the hard snow. Of course common sense tells me not to turn untrained cows into two feet of hard snow and expect them to do well swath grazing for the first time. Starting them on the system when there is only a little bit of snow or having experienced cows with them should be enough to train any new cows. I also plan ahead for severely cold weather. I’ve been swath grazing at -47 C (-53 F). Each year, I try to fence off a treed area that can be saved for these cold periods. I do not want the cattle to have continuous access to the treed area because they will damage the trees, remove most of the underbrush and pack down the snow. If I save this area, it will be much warmer on cold days as it will provide protection from the wind, and possibly a fresh bed of snow. Fluffy snow acts as insulation. When the cold spell hits, I just open up the gate and offer them the protection of the trees. Stopping the wind is very important during those cold spells. If you don’t have trees, wind breaks might be necessary. If I am swath grazing crop residues or another lower-quality feed, I will plan to set up the bush as a bale grazing paddock. During the cold spell I need to increase the ration. If the crop residue is of low feed value, I switch to bale grazing with higher-quality hay. A week or two of bale grazing will usually get me through the cold spell. When the swath quality is poor, I have seen cattle simply stop grazing at temperatures colder than -30 C (-22 F). Wildlife is another concern. For me, this is mostly because of the maturity of the crop grazed. I had two fields side by side containing the same crop of oats that was seeded and swathed the same. But one field matured faster because of poor fertility. The first field was still in the milky stage when it was cut and the second had seed in the heads. I had about 50 to 100 deer on that second field every night going after the grain in the heads. They not only ate a good portion of the grain in each swath, they packed the snow down and caused it to freeze solid so the cattle were unable to graze it later. The deer never touched the first field and we swath grazed it no problem. How about spring breakup? One year we had cattle out grazing on a zero-till grain field in April when the frost came out of the ground. Oops. Now I try to be done swath grazing by then. Not only did the cattle damage the field, they stepped a lot of feed into the mud. That is not a way to keep a grain farmer happy. I’m also a fan of grazing polycultures. More than once while swath grazing, I have run into nutritional imbalances when grazing monoculture crops. One year it was a lack of protein, another it was a mineral imbalance that caused two cows to go down. Now, when I am offered a monoculture crop to graze, I make sure we supplement with some hay or pellets and ensure that we have a full mineral package available for them. 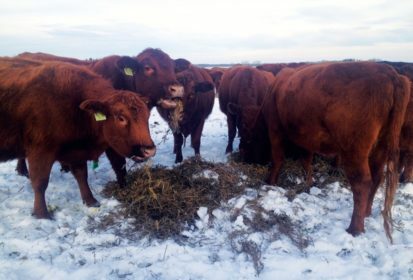 I hope this hasn’t scared you off swath grazing, because I have found swath or residue grazing to be a very economical way to feed cattle during the winter months. Steve Kenyon runs Greener Pastures Ranching Ltd. in Busby, Alta.